Science of Doom has a great blog explaining many aspects of climate science, with an emphasis on the underlying mathematics (and some of the physics). If you want to learn the maths and physics underpinning the greenhouse effect and lapse rates and adiabatic processes, you'll probably at some stage come across an article by Science of Doom. A day or so back, for some very strange reason (ostensibly because he was reading a book), Science of Doom decided to fan the flames of climate science denial, unwittingly I would think. Science of Doom has written a very long article decrying the use of the word "denier" when applied to those who deny climate science. He drew on graphic word imagery of the WWII Holocaust to boost his argument. It was clearly an appeal to emotions. Apparently he wants the plain English word "denier" reserved for the very small number of people who deny that there were millions of people, mostly Jewish, who were massacred by Nazis around the time of the second world war. I'm not objecting to his decision to not use the word "denier" when describing people who wilfully reject climate science. That's his prerogative. What I don't like is that his ill-founded article just gives ammunition to climate science deniers. And I don't agree that the word "denier" when used in any context other than WWII, equates with the Nazi Holocaust. It doesn't. In the context of climate science it refers to a person who wilfully rejects the science. There is no intent, for most of us, of linking it to any other context in which the word is used. What makes a person reject climate science? The worst you could say is people who don’t accept ‘consensus climate science’ are likely finding basic – or advanced – thermodynamics, fluid mechanics, heat transfer and statistics a little difficult and might have misunderstood, or missed, a step somewhere. The best you could say is with such a complex subject straddling so many different disciplines, they might be entitled to have a point. it's their job (eg they work for the Heartland Institute or the IPA or CFACT). Watts: "They want to change policy, they want to apply taxes..."! There are other examples. I've documented some of the reasons given by science deniers themselves for rejecting climate science - here and here. It is rare that it's because they don't understand the intricacies of climate science, even in their own mind. Many reject climate science because they have a tendency to conspiracy ideation, or because they distrust normal authorities on any subject with which they want to disagree. Think about yourself. Do you accept or reject climate science because you have difficulty with the maths or physics? Be honest with yourself. If you are a climate researcher yourself, do you understand every aspect of every discipline that is related to climate science? It would be a rare person who could keep abreast of the details of developments in every area of the earth and atmospheric sciences. As I commented at Science of Doom: One doesn't have to know how to work out equations to accept climate science any more than one has to understand the intricacies of biology to accept evolution, or the details of geology to appreciate the age of the world, or the ins and outs of modern physics to accept that there are tiny particles, or an in-depth understanding of the immune system to accept or reject the value of vaccines. Other people have stepped up to the plate as well. Keith Kloor wrote a follow up article. His was more nuanced and he emphasised how deniers wrongly like to portray themselves as "sceptics". However he also mistakenly thinks that the word "denier" is only associated with the WWII Holocaust. And he implies that it forever should only be associated with that. It's revisionism. The word "denier" is just a word, based on the verb "to deny" - which is quite old and stems originally (according to Oxford) from Latin denegare, from de- 'formally' + negare 'say no'. I don't recall ever seeing people decrying the use of the term "denier" when applied to people who deny the link between HIV and AIDS. If anyone knows of a groundswell of complaints I'd be grateful. Ironically, Keith Kloor says "This language police campaign is unbecoming." I agree with that. Except I don't agree with Keith in this case. He is setting himself up as the language police. Keith is complaining about an overt push to describe people who reject climate science as climate science deniers. That pushback is to counteract the tendency of some media outlets to give at least equal billing to climate science deniers as is given to people who understand climate science. Thing is, I won't comply with the language police who want to stop me from labelling people who wilfully deny climate science as climate science deniers. Why do people pander to climate science deniers who object to the label? I can't answer that. I'm interested and did ask SoD. Even if he tries to answer he may not really know himself. [Update: SoD has responded to feedback, and explained the source of his opinion. A good comment. Sou] Perhaps people do it to appease climate science deniers. To present themselves as "fair and reasonable" so as to appeal to those who are inclined to denial but may be persuaded otherwise. Would they want to appease "HIV/AIDS deniers" in the same way? What about people who subscribe to Elisabeth Kübler-Ross's five stages of grief? If your objective is to get more people seriously engaged with the climate change issue, you probably want to avoid unwittingly antagonizing them with derogatory language. And by them, I mean the lurkers and fence-sitters in the mushy middle who tune in and out of the volatile climate discussion. Interestingly, I didn't see in SoD's article or at Keith Kloor's blog, any similar discussion of the word "holocaust", which is also just another word. It is only when capitalised and preceded by "The", or paired with the word "denial" or "WWII" or in context of a discussion about the same that it refers to the horrific mass murder by the Nazis. The word "holocaust" means "destruction or slaughter on a mass scale". It can also be paired with the word "nuclear" for example. I don't see people decrying that usage. It is very unfortunate that right now, when there are signs that the Overton Window is being shifted in favour of science, that people want to shove it back to encompass science denial. I doubt that was the intention, but that is a possibility, albeit unintended. Fake sceptic: as for climate science denier. This is to highlight the silliness of deniers claiming, contrary to evidence, to be "sceptics"
Normal person: a person who does not wilfully reject climate science. Just rejecting a particular paper or part of climate science does not qualify one to be labelled a climate science denier. There is plenty of room for alternative explanations of the detail. That's what science is all about, after all. To not be persuaded about one or other particular aspect of climate science is fine by me, but it helps if one explains the reasons. I don't care if you use the word or not, yourself. Some people avoid it for one reason or another. A common reason for not using it is to not distract from whatever they are wanting to say. Often-times I'll avoid it for that very reason. Others don't want to "fan the flames". Again, depending on where I'm writing, I'll often not use it in particular locations for that very same reason. Some people don't use it because it is also used in connection with "Holocaust denial". I've not seen anyone not use it because it is also used in connection with "HIV/AIDS denial". Objection to the word "denier" in the context of climate science denial is most often used by tone trolls. People who want to derail a discussion about climate. In my experience, the people who most often object to the word are climate science deniers. "Climate change deniers, delayers and fake skeptics are so boring and predictable"
Moby, how about stopping the name calling? If that's what you think of fellow posters, why not find somewhere else to post where people agree with you? The cease fire was broken shortly thereafter by another science denier. From yesterday: Calling scientists frauds and fakers just pisses them off! Denier is also used occasionally in relation to biology. Anti-vaxxers are strange enough, but often enough they also turn out to be germ theory deniers. As do many proponents of homeopathy and various other "natural health" ideologies. It shouldn't be a surprise or a shock, but it often is to me. Denier sometimes pops up in those interminable "discussions" on evolution you get on some sites. As for general usage, surely everyone knows about the 5 stages of grief with denial being the first stage. That also extends to denial about illnesses, either of your own or a relative. I have argued much on line with Holocaust Deniers and they use the same tricks, rhetorical fallacies and conspiracy ideation as climate change deniers. If it walks like a duck, & quacks like a duck, then it is a duck/ denier. SoD responds to criticism. Rather well IMHO. Thanks, VTG. I'll add a link to that in the article. Hmmm...he still wants others to follow *his* interpretation of the term, regardless of whether the user wants to make a link to holocaust denial ("revisionism" - the holocaust denier will demand). It is also clear he hasn't been around in many other scientific debates. HIV/AIDS deniers ("dissidents" - they will say themselves) is a common description in the mainstream media. Evolution deniers are more commonly referred to by different terms that directly describe what they actually believe (creationists, IDers - or cdesign proponentsists), but evolution denial is also in use. Denial is simply a description of behaviour, and another word is added in front to indicate what is 'denied': holocaust, HIV/AIDS, climate, evolution. Yes he does, Marco. And no I won't (follow his interpretation or stop using the word). Like Sou, I wasn't indicating that I agreed with SoDs position, merely that he had clearly listened and changed as a result. Behaviour rarely seen in the climate debate. Having followed the thread there, I have to confess I was surprised how many people have made direct allusions to holocaust denial in the past. Something which would always be ill-advised, I think. I do not go to Andrew's site per definition, so I will not look at the quotes. However, there should be no surprise that denialism of different forms is being compared. There is a striking similarity in how deniers process and filter information. So, yes, holocaust denial and climate change denial are associated, but only in that processing/filtering sense. I should note that this does not mean a climate change denier is a holocaust denier, or morally comparable to a holocaust denier. Perhaps it would have been better to not compare to holocaust deniers, but rather to HIV/AIDS deniers, whose tactics have perhaps been more similar to those of climate change deniers. I think denier is an OK word and should be able to be used, and I think the Holocaust link is not so present in people's minds, or wasn't until sceptics made an issue of it. But the hassle is boring, so I don't. I lean toward "naysayer"? Was Safire a climate science denier? He died just before Climategate. I thought that was a Spiro Agnew quote? Technically Agnew's speechwriter, but yes. I think SoD scores a good point in noting that having an informed opinion of climate science is not a trivial undertaking. I'd like to think that only 97% of my belief in AGW is based on native trust of the scientific method and peer-review, but the inconvenient truth of the matter is that I probably understand less than a tenth of a percent of all the relevant science there is to know. He could have made that point without gifting science deniers quarter for their own poor behavior. I see from his follow-on comments that he's saying in his experience he's never understood the term to not have an association with Holocaust deniers. I'm inclined to accept that explanation. BTW I'll disagree with SoD's ideas in his blog article, but I'd not dream of questioning his explanation. He's solid and I've never found him to be anything but courteous and up front. Sou, I'm putting my understanding of the actual science at less than 1/10th of a percent. If you rate yourself considerably less than that, I'm the poster boy for D-K and need to have my head examined! Brandon, if you take all the fields relating to climate including paleo-climate and atmospheric sciences, broaden it to earth sciences, geology etc, and add in oceanography, ecology, agricultural science, forestry, glaciology, marine sciences and more - it's humungous! And then there's basic physics, chemistry and biology and all the various facets of those (think micro-physics of clouds as just one tiny example). I find myself having to revisit things I thought I knew (eg Milankovitch), then read the latest developments - and I almost always discover new things (or realise that what I thought I knew I didn't fully understand). Sou, you are of course correct. When I was in college, the chemistry library put it into perspective for me. From the checkout desk, one could gaze upward into four storeys of the stacks and see nearly every shelf. I recall lamenting that I could spend a lifetime and not understand every page of every book in but one of those countless shelves. So many people miss the point about all this (not Sou). It it tactical. Contrarians say: you *must* call us sceptics. You must *not* call us deniers (or we will traduce the memory of the Holocaust dead by playing the victim in all their names). It is simply a way of establishing a bogus legitimacy. THAT is why it is intolerable. I don't strongly advocate for (or routinely use) 'denier' when talking to those I typically describe as contrarians. But this endless, creeping attempt to give themselves false legitimacy needs to be understood and treated with the zero tolerance it deserves. NB Joshua, if reading. I don't get the sense you ever really understood what I was saying on this issue. Although it's funny that deniers even object to the word "sceptic" when it suits them (to bolster group cohesion and play the victim). BBD, I agree that it's tactical. Clearly SoD missed it. He can't be the only one. So my comment is of the be mindful of the lurkers variety. Just wanting to make sure that point isn't getting lost. Agree strongly with BBD. I sometimes use the word, sometimes not. I don't keep track. For my anecdote, I never thought of the connection even as a Jewish person with Holocaust surviving relatives. I don't believe in legitimizing any group that's anti-fact or anti-science, whether it's the moon landing , creationism/ID, flat earth-ism, 9/11 conspiracies, anti-vax-ism, or climate science denial. I thought censoring of 'to deny' was invented by Watts, which led me to invent 'climate revisionists'. Still the second to best term for them (the best being thugs). My favourite definition of denier is "equal to one twelfth of a sou" (referring to old French coinage). I hope you know that there's been a revaluation of the sou and a devaluation of the denier. The sou now worth an infinite number of deniers. Please spare us that infinity! "We know what we must do to mitigate this possible future genocide, but we need our collective will to do so. We can’t allow the deniers to win again." It seems he thinks the term is appropriate. so they're down for an average temperature change of 0.0/century. Would you mind providing links to the "observed" figures? Oops...I saw those as temp DECREASES on my phone. So sorry. We've got to be careful with this. You can't use historical observed trend as a guide to future trend resulting from future increases in forcings. The historical trend results from a combination of much weaker forcing (evolving over time) and natural variability. The historical trend since 1979 is heavily influenced by the recent slowdown in the rate of surface warming which is likely to be the result of natural variability overprinting the forced trend. 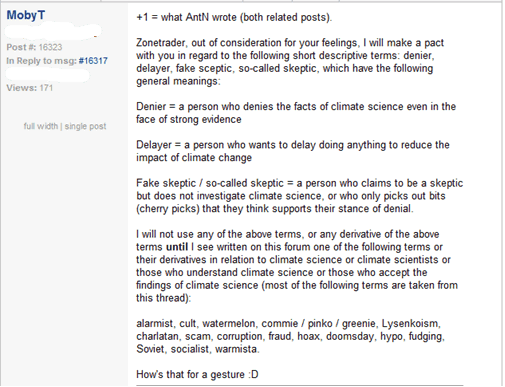 I am quite clear about my use of denier, and I either mentioned it on SOD or another article discussing it. To me a denier is somene who is completely uncritical of assertions that ACC is wrong and unwilling to accept actual evidence that it is basically real. In discussion with people I refer to those criteria, and warn them that they are using the rational of deniers by pointing out when they are doing those things. I personally believe there is a slight possibility that ACC is flat out wrong in practice. That there is some wonderful mysterious or misunderstood mitigating factor that will prevent temps from increasing more than 1° in the next century. If you show me that you are willing to critique information rationally based on the source and the content, you cannot be a denier. someone like Curry, I consider an opportunist. Someone that is not intreated in determining the truth but knows the issues well enough to twist them in the direction she wants people to accept. It seems to me that Denialism is a very suitable psychopathology for study but I am NOT suggesting that climate science deniers should be the subjects. I have no evidence that climate denial is anything other than a normally formed opinion, even if some deniers form those opinions whilst watching or listening to Alex Jones. I'd like to talk about the utterly bizarre HIV/AIDS denial by seemingly intelligent and educated leaders. For reasons professional and political I visited the ANC in exile in the frontline states of Africa in 1985. Australians were very welcome in southern Africa because of Malcolm Fraser’s leadership between 1976 and 1983 in defeating Thatcher and Reagan re the imposition of worldwide sporting, trade and financial sanctions against the Criminal Apartheid Regime. I joined the Anti-Apartheid Movement in Sydney in 1971 aged 14. In Lusaka, Zambia I met the President of the ANC Oliver Tambo (The ANC vice president Nelson Mandela was locked up in Pollsmor Prison in Cape Town at the time). I also met and spent time with the ANC's director of the Department of Information Thabo Mbeki. I ended up sharing a bottle of Jonny Walker Black Label with Mbeki in Lusaka. I was sick for days and have not touched spirits since. Mbeki was unaffected. Mbeki, a London trained economist with 2 bachelor degrees and a Masters would become the second democratically elected President of the Republic of South Africa in 1999. He was no Desmond Tutu but Mbeki was to all intents and purposes a rational leader except for the bit where he caused the deaths of tens of thousands of newly born children and the early deaths of their parents. Mbeki was mentally incapable of comprehending the catastrophe caused by his denial that the HIV retrovirus caused AIDS. If he did have any moments of clarity, the truth was too much for him to confront and so he retreated to the comfort of denialism. By the year 2000 generic anti-retroviral drugs were cheap and extraordinarily effective. The literature was conclusive and more, AIDS ravaged Botswana RSA’s immediate neighbor to the north delivered free treatment to all HIV positive citizens. Mother’s milk in Bots became virus free and people JUST STOPPED DYING. The evidence was too compelling to resist. Mbeki not only refused to distribute Antiretrovirals he banned them from use in all RSA hospitals. His argument was that AIDS was caused by poverty. Mbeki’s Health Minister was the drunkard Manto Tshabalala-Msimang. She was a also shared Mbeki’s views on HIV. She believed that AIDS could be cured with beer and beetroot (that is neither a distortion nor a simplification of her prescriptions). Her power was diminished when her liver stopped metabolizing her preferred liquids. Happily for her, being Health Minister also gave her the ability to bump herself to the top of the liver transplant queue. Mbeki was viewed as a dangerous joke by both NGOs and governments. He bizarrely equated international and local criticism of his denialism to Apartheid. autobiography and I’m not sure if he mentions it, but it is my understanding that in private meetings with Mbeki he convinced him that he was in error but did so in a way that enabled Mbeki to walk out of that meeting with his self esteem intact. Whilst Mbeki’s self esteem was the least of humanity’s worries, Bill Clinton realized it was vital to the health of South Africans. Fascinating story, PG. What an adventure. ==>" NB Joshua, if reading. I don't get the sense you ever really understood what I was saying on this issue." For some reason, I can't comment in reply above. Anyway, perhaps you're right. Or perhaps I just disagree. What specifically do you disagree with? I can't say more until I'm clear what we are discussing. that is an awesome story. Ideology is the great binder of intelligence. In the US now the republican party has so connected itself to small government and simplistic libertarianism, that many people hold the delusion dear that ALL regulations and laws are bad. they of course don't really believe that, but they can apply it to any law or regulations that they don't like and assert with complete confidence that it is by definition inefficient and damaging, without needing any actual basis for that other then their belief. References, links? Back up your assertion with evidence. I stand right next to Sou on this, as many old-timers from the halcyon Deltoid days will know. And as BBD pointed out, the whole confabulation of a generalist noun with a specifying adjective is a deliberate tactic of these very same deniers to turn the tables on those who are pointing out that they are indeed involved in a straight-out process of denying. I'm sad to see that SoD was one of those side-tracked by a political gambit which has been hugely successful in shunting the focus from the fact of the denialism in the first place. My grandfather had to face the Nazis when they invaded the Netherlands in WWII, and he was active in hiding fleeing Jews in bolt-holes and then smuggling them out of the country. I therefore have a sensitivity to those who deny the Holocaust, but in no way to I make the confabulation that acknowledging climate science denialism is the same as accusing the denier of Holocaust denialism. None of my Jewish friends make this confabulation either, and indeed some are highhly offended by the fact that it's used by the anti-science movement to hamstring the use of the term when referring to what is, in plain fact, denialism. And please, when we're at the stage that people type "den1er" or "d****r" or "d-word" it's way past time that people take a breath and go back to first principles. It reminds me of the fragile types who type "s3x" or "br3ast" "f-word" or other such euphemisms of delicacy or misguided political correctness. When it's reached that stage the deniers have won, because they've succeeded in muzzling the scientific and lay communities from being able to even refer to the psychological and/or political processes involved in contradicting the facts, let alone to discuss and decide on what to do about the denied phenomena. This is one of the reasons why it's already too late to acheive the best outcome for the ecosphere, and why we're now on a footing to at best salvage just a fraction of the biodiversity and ecological functions that we could have retained if we'd properly acted a decade or two ago.